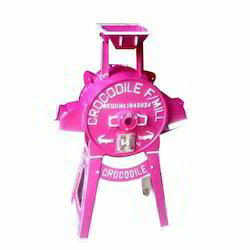 With the help of experts, we have become one of the well-known companies of Flour Mill Machine. Our products are enormously praised by customers due to their longer life and easy to use. Our organization is engaged in manufacturing and exporting of unique range of Pedestal Type Flour Mills. To add moisture to grains regulated water feed rate is required to decide the desired percentage of moisture addition. In absence of a computerised programme, Rotometer Assembly is a better equipment to regulate the flow of water to add with a material stream. It is automatically switched off when power supply is off. - KASTURI - CLASSIC Heavy CHAKKI: Body + Heavy Pulley Hooper Shaft only 16" 9800/-, 20"
Wheat Chakki Body (Flour Mill) machine is Manufactured by Graded Cast Iron, Tested Mild Steel, Tested Carbon Steel, Emery Stone, and also highly sophisticated machining It’s an old techquine but it dust food grain very smooth and no foreign body mixed with this grain. This machine is operated by power (Electric or Engine). Reckoned to be the prominent name in the industry, we are engaged in offering the quality range of Flour Grinding Machine. Our range is manufactured from premium quality material, sourced from reliable vendors. Well-equipped infrastructure owned by us enables us to carry the production with great ease in committed time-frame. Natraj commercial flour mill i by nishant ads. 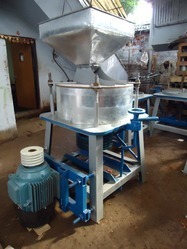 Flour Entoleter or Famously Known as Jet Separator is used to remove Moisture or Dampeness from Wheat Flour.